Between 1866 and 1915, more than 25 million immigrants poured into the United States. 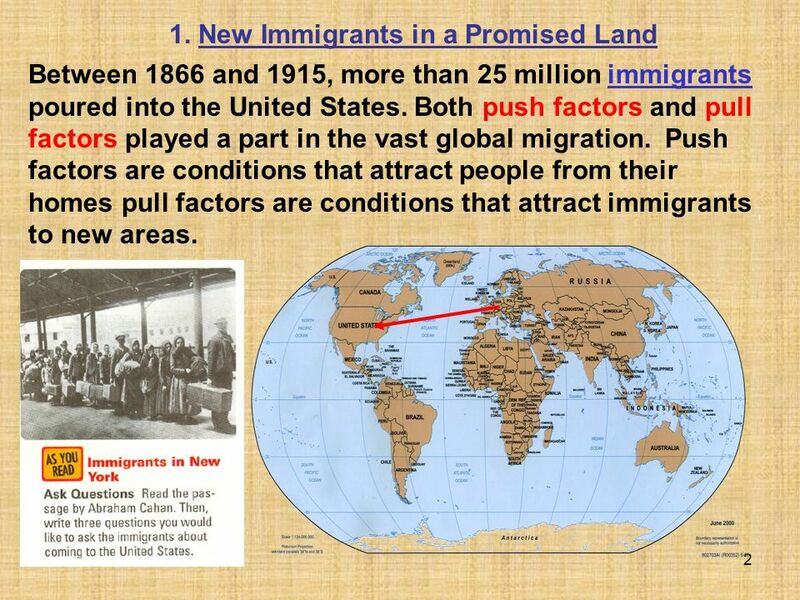 Both push factors and pull factors played a part in the vast global migration. Push factors are conditions that attract people from their homes pull factors are conditions that attract immigrants to new areas. 5 Political and religious prosecution pushed many people to leave their homes. 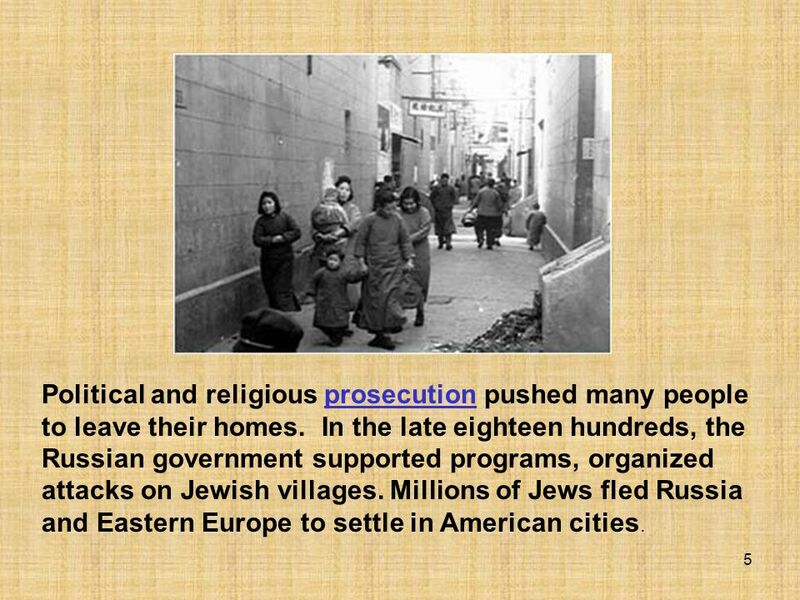 In the late eighteen hundreds, the Russian government supported programs, organized attacks on Jewish villages. Millions of Jews fled Russia and Eastern Europe to settle in American cities. 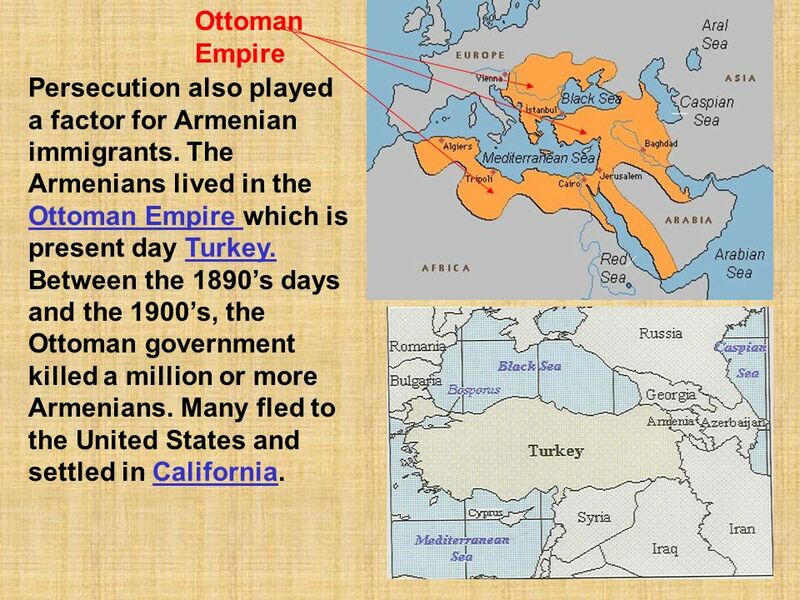 6 Ottoman Empire Persecution also played a factor for Armenian immigrants. The Armenians lived in the Ottoman Empire which is present day Turkey. Between the 1890’s days and the 1900’s, the Ottoman government killed a million or more Armenians. Many fled to the United States and settled in California. Leaving their homes required great courage. The voyage across the Atlantic and Pacific was often miserable. Most immigrants could afford only the cheapest seats on boats traveling to the Americas. Ship owners jammed up to 2000 people in steerage compartments in crowded spots on their ships. In these close quarters, disease is spread rapidly. 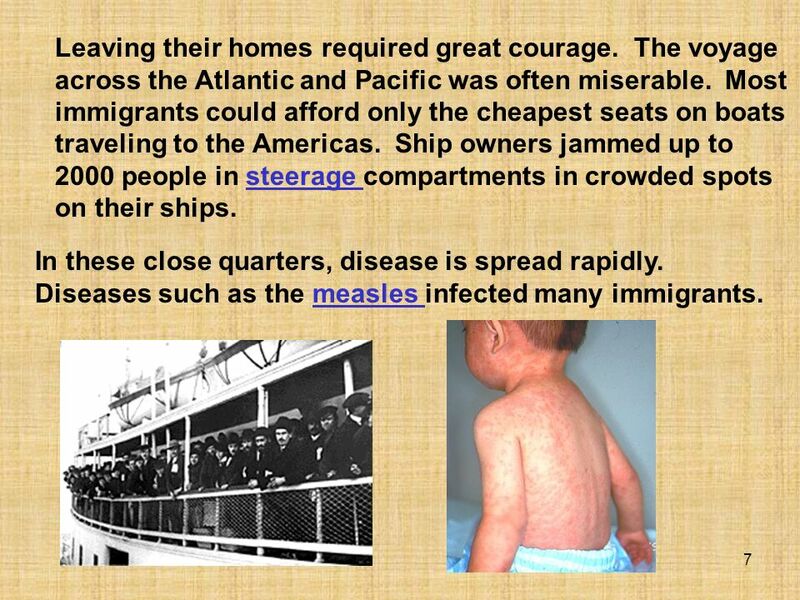 Diseases such as the measles infected many immigrants. For most European immigrants, the voyage ended in New York City. There, after 1886, they saw the giant Statue of Liberty in the harbor. 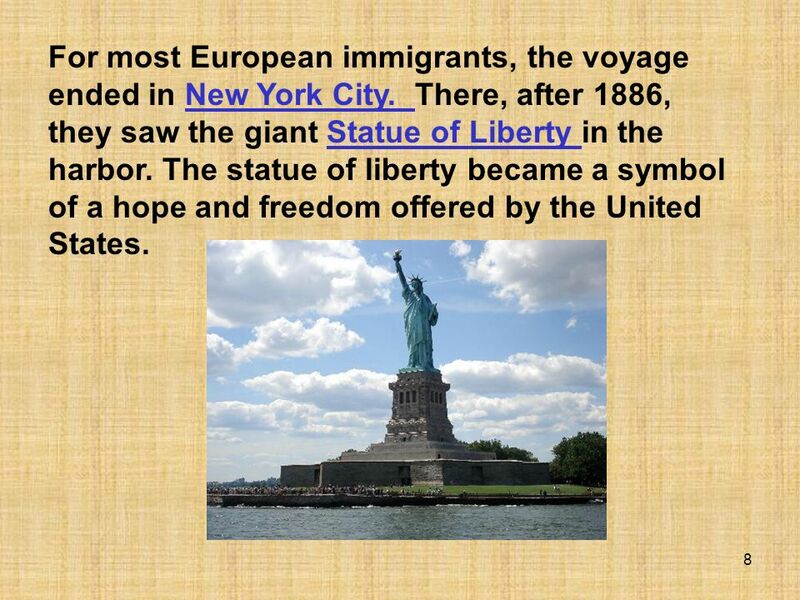 The statue of liberty became a symbol of a hope and freedom offered by the United States. 9 After 1892, ships entering New York harbor stopped at the new receiving station on Ellis Island. Here, immigrants faced a last hurdle, the dreaded medical inspection. Doctors examined eyes, ears and throats. 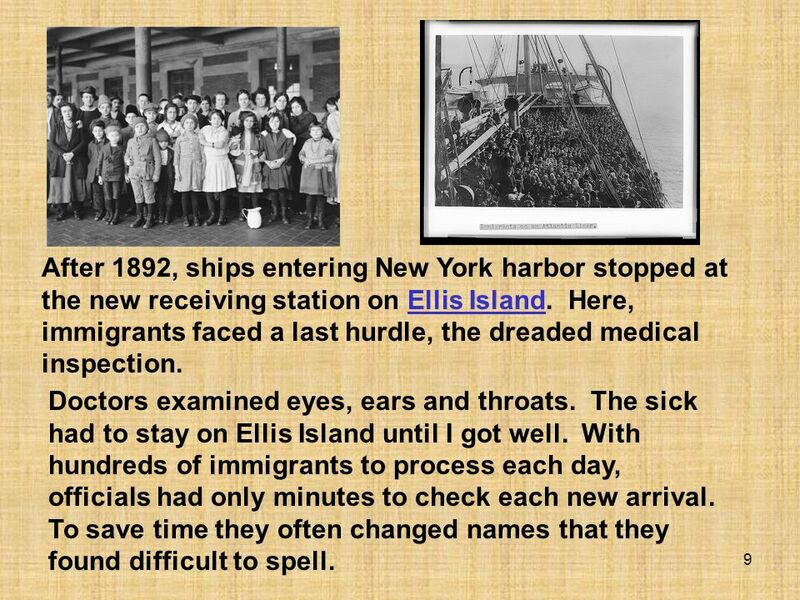 The sick had to stay on Ellis Island until I got well. With hundreds of immigrants to process each day, officials had only minutes to check each new arrival. To save time they often changed names that they found difficult to spell. 10 Ellis Island In the late 1800’s, the patterns of immigration changed. Large numbers of people arrived from the Southern Eastern Europe. Millions of Italians, Polish, Greeks, Russians, and Greeks and landed in the Eastern United States. Stopped at Ellis Island before arriving in New York City. 11 Many immigrants have heard stories that the streets of the United States were paved with gold. 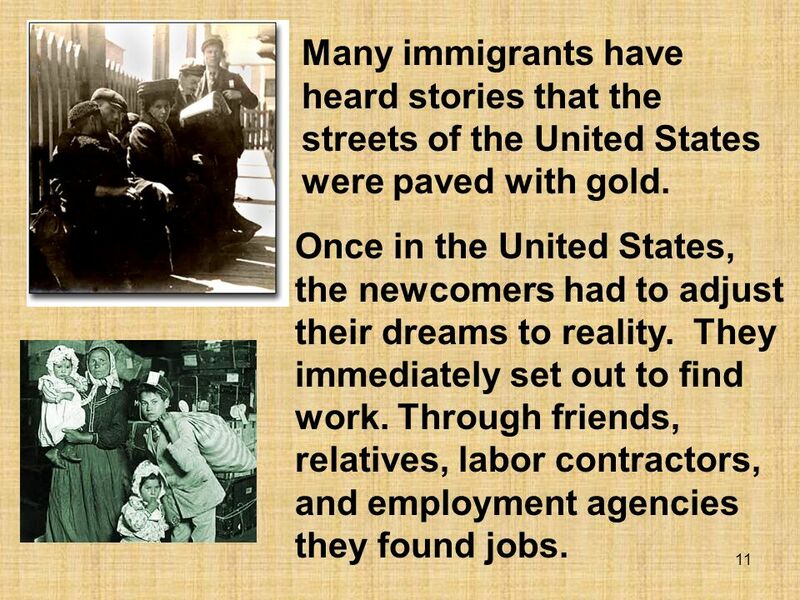 Once in the United States, the newcomers had to adjust their dreams to reality. They immediately set out to find work. 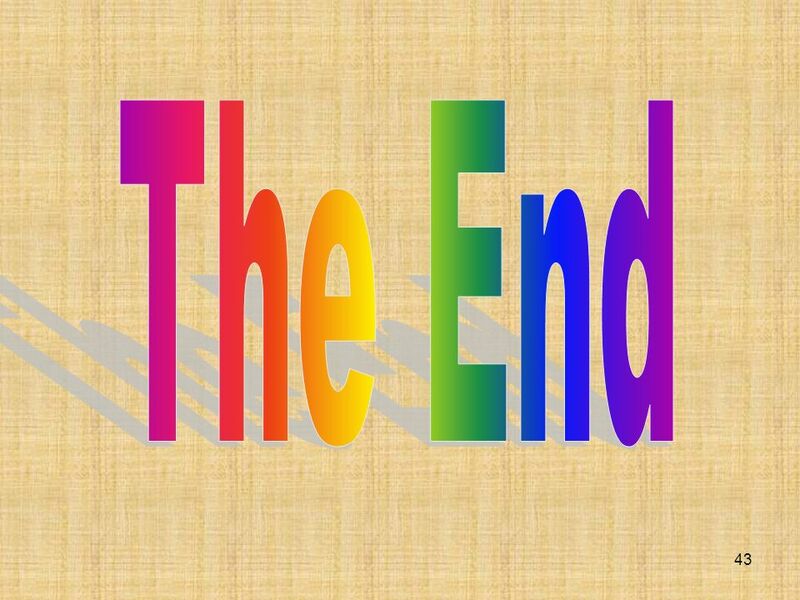 Through friends, relatives, labor contractors, and employment agencies they found jobs. 12 Immigrants adjusted to their new lives by settling in neighborhoods with their own ethnic group. An ethnic group is a group of people who share a common culture. Within these ethnic neighborhoods, newcomers spoke of their own language and celebrated special holidays with food prepared as in the old country. Religion stood at the center of immigrant family life. Houses of worship sprang up in most neighborhoods. They brought at the groups together. In their effort to adapt, many immigrants sometimes blended their native tongues with English. They became part of a new culture. 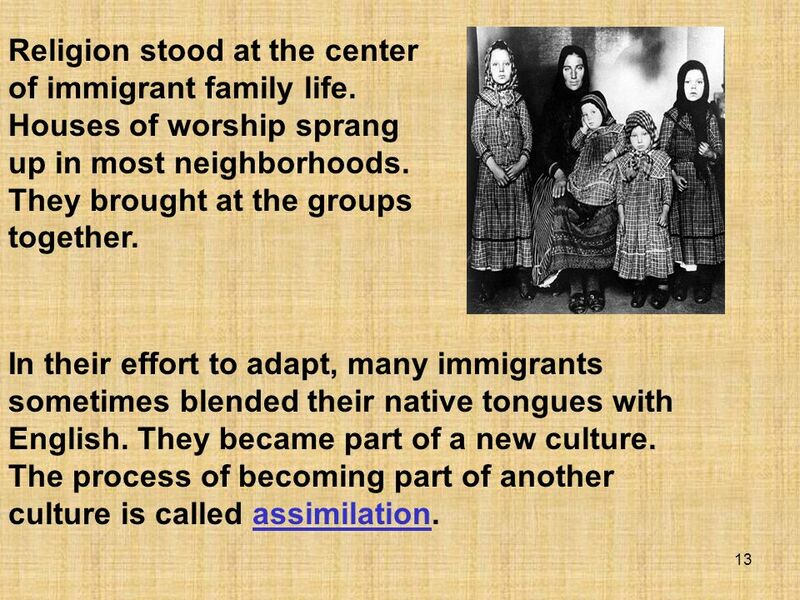 The process of becoming part of another culture is called assimilation. Many Americans opposed the increase in immigration. They felt the newcomers were too different. They wanted to limit immigration and preserve the country for native born white Protestants. These people were called nativists. 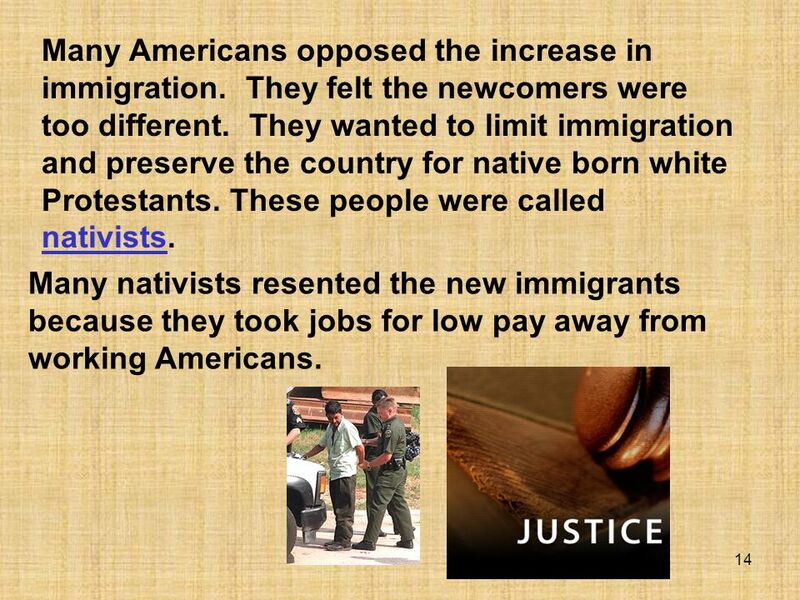 Many nativists resented the new immigrants because they took jobs for low pay away from working Americans. One of the cultures that the nativists targeted was the Chinese. The Chinese immigrants helped build the railroads. Most Chinese people lived in cities in an area called Chinatown. Most Americans didn’t understand why the Chinese would learn American ways. As the numbers of Chinese moved into the United States. Prejudice and violence against them began to increase. 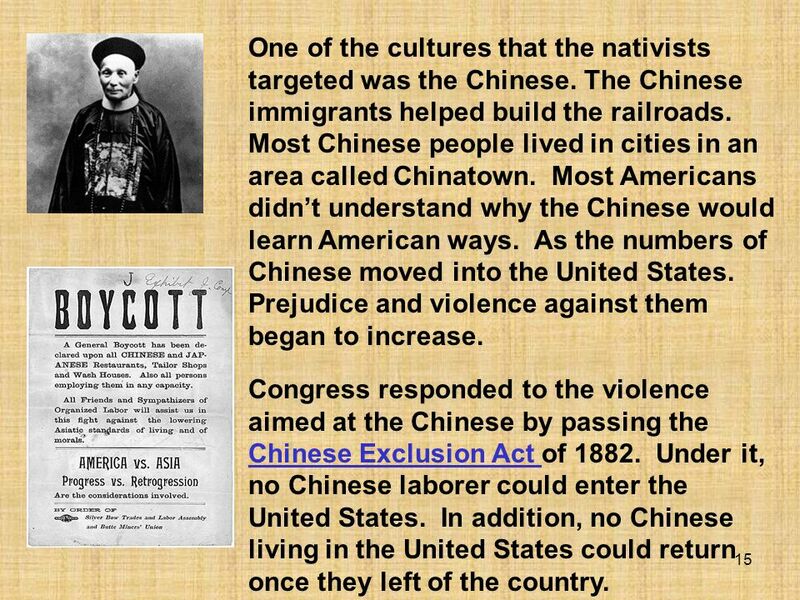 Congress responded to the violence aimed at the Chinese by passing the Chinese Exclusion Act of Under it, no Chinese laborer could enter the United States. In addition, no Chinese living in the United States could return once they left of the country. 16 2. 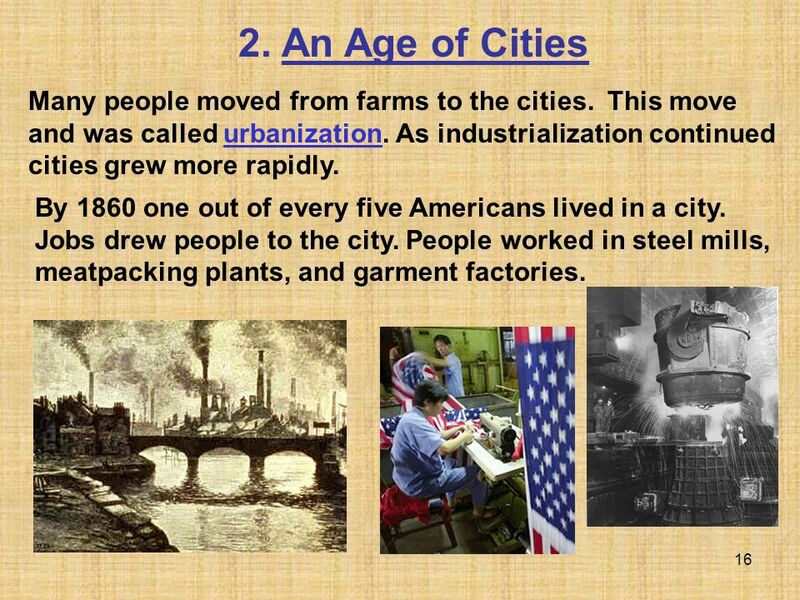 An Age of Cities Many people moved from farms to the cities. This move and was called urbanization. As industrialization continued cities grew more rapidly. 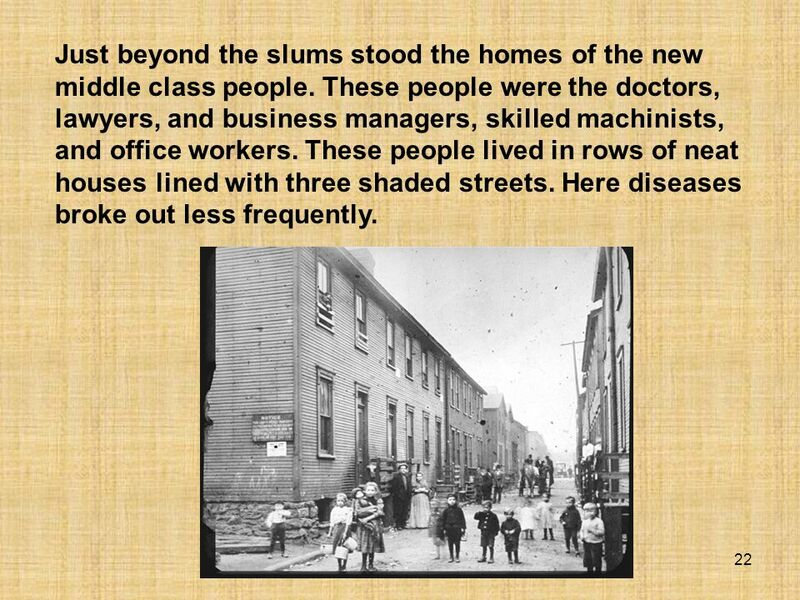 By 1860 one out of every five Americans lived in a city. Jobs drew people to the city. People worked in steel mills, meatpacking plants, and garment factories. 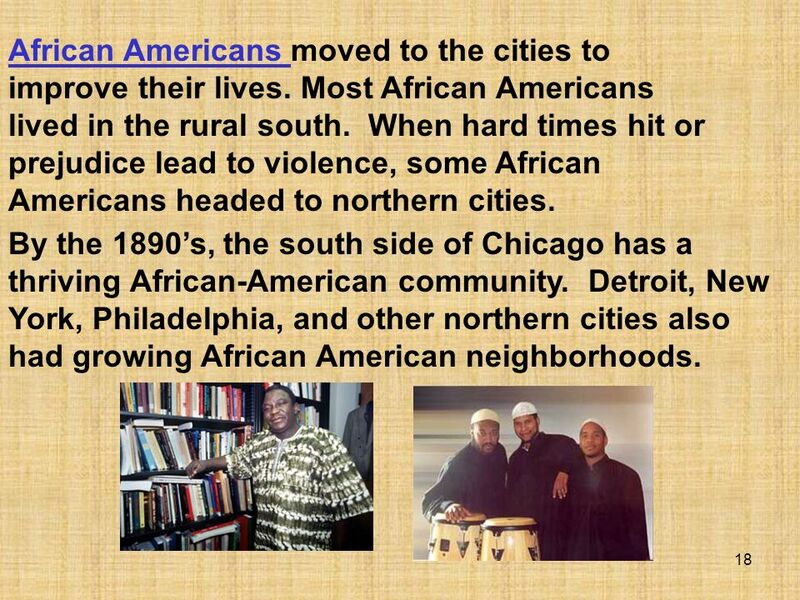 African Americans moved to the cities to improve their lives. Most African Americans lived in the rural south. When hard times hit or prejudice lead to violence, some African Americans headed to northern cities. By the 1890’s, the south side of Chicago has a thriving African-American community. Detroit, New York, Philadelphia, and other northern cities also had growing African American neighborhoods. 19 City Life Many poor families crowded into the cities oldest sections. 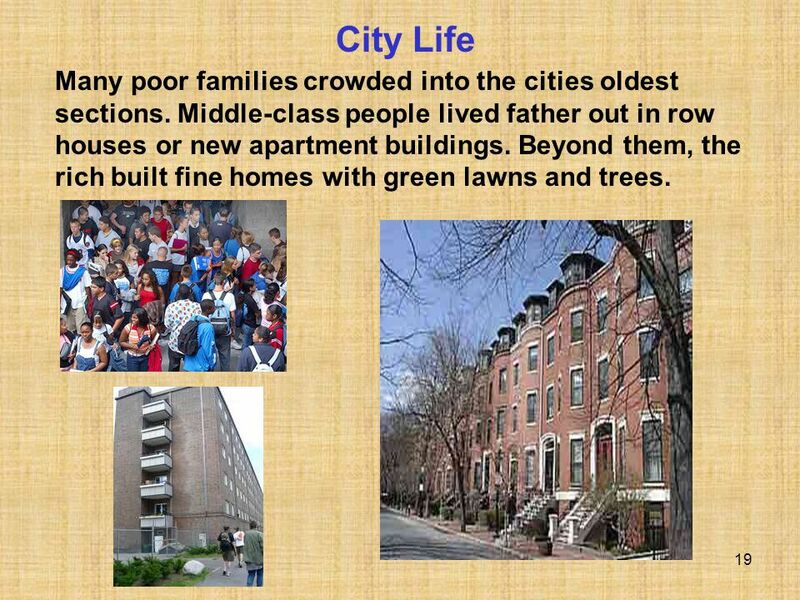 Middle-class people lived father out in row houses or new apartment buildings. Beyond them, the rich built fine homes with green lawns and trees. Poor families struggled to survive in slums. The streets were jammed with people, horses, pushcarts, and garbage. Living space was very limited so builders devised a new kind of house to hold more people. They put up buildings six or seven stories high. The divided the buildings into small apartments, call tenements. 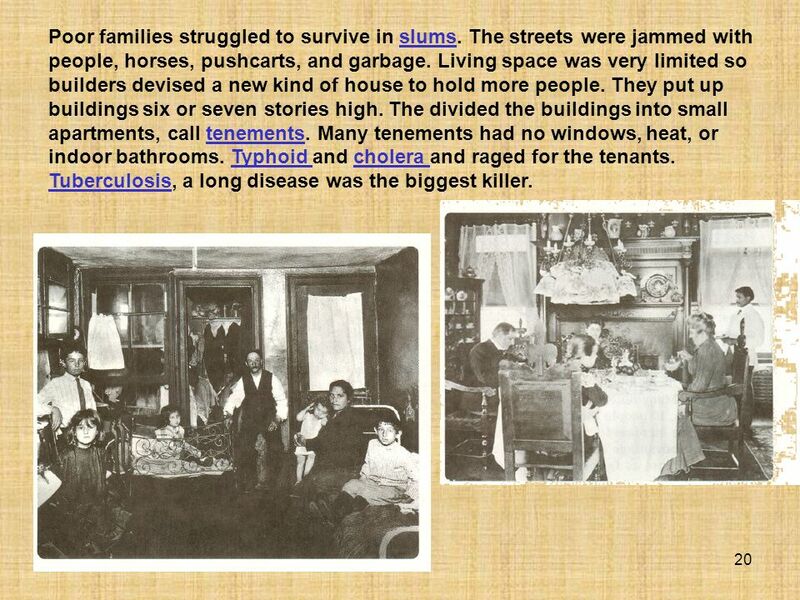 Many tenements had no windows, heat, or indoor bathrooms. Typhoid and cholera and raged for the tenants. Tuberculosis, a long disease was the biggest killer. In the1880’s reformers asked for changes. Building codes were established that provided standards of safety. 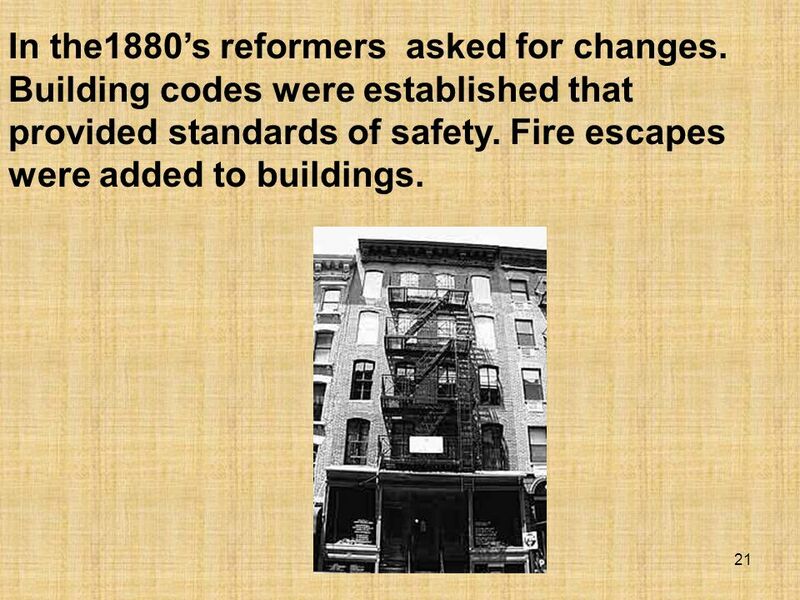 Fire escapes were added to buildings. Just beyond the slums stood the homes of the new middle class people. These people were the doctors, lawyers, and business managers, skilled machinists, and office workers. These people lived in rows of neat houses lined with three shaded streets. Here diseases broke out less frequently. Many religious organizations helped the poor. The Protestant ministers began preaching Social Gospel. They called upon their church members to do what is needed to help the poor. 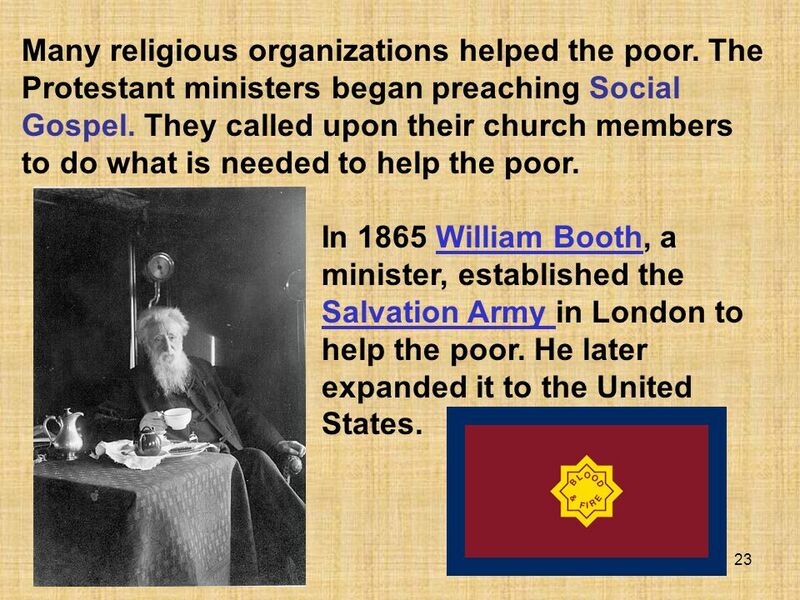 In 1865 William Booth, a minister, established the Salvation Army in London to help the poor. He later expanded it to the United States. 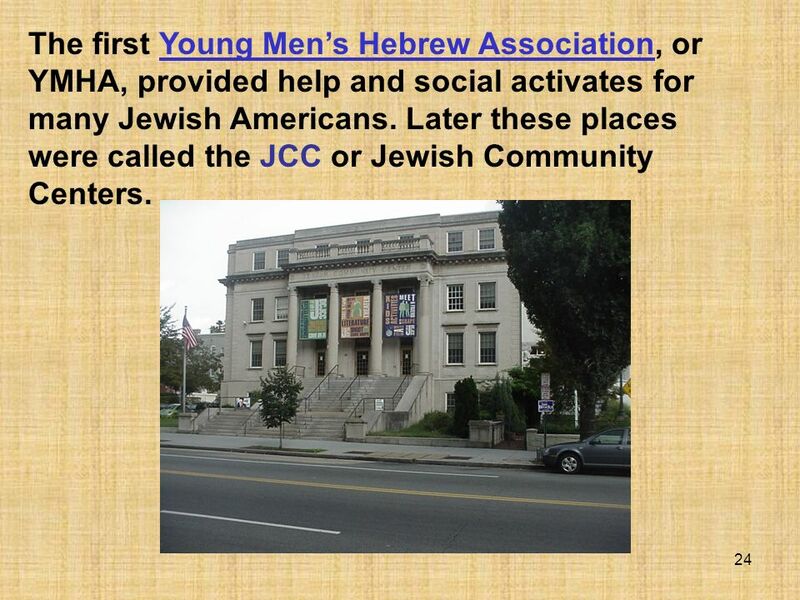 24 The first Young Men’s Hebrew Association, or YMHA, provided help and social activates for many Jewish Americans. Later these places were called the JCC or Jewish Community Centers. 25 Settlement Houses, or community centers, were also started to help the poor. 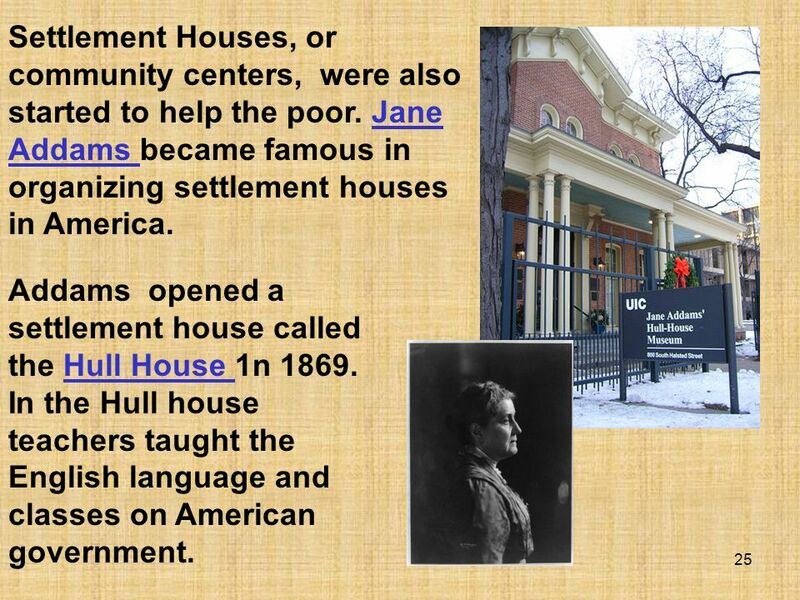 Jane Addams became famous in organizing settlement houses in America. Addams opened a settlement house called the Hull House 1n In the Hull house teachers taught the English language and classes on American government. A building boom changed the face of American cities in the late eighteen hundreds. Cities like New York ran out of space in their downtown areas. Resourceful city planners and architects decided to build up instead of out. Using new technology, the designed tall buildings with many floors called skyscrapers. 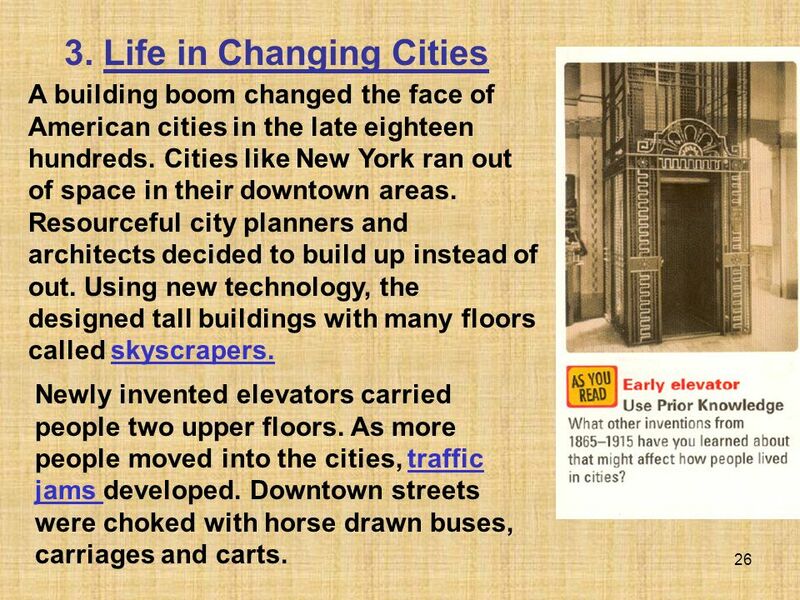 Newly invented elevators carried people two upper floors. 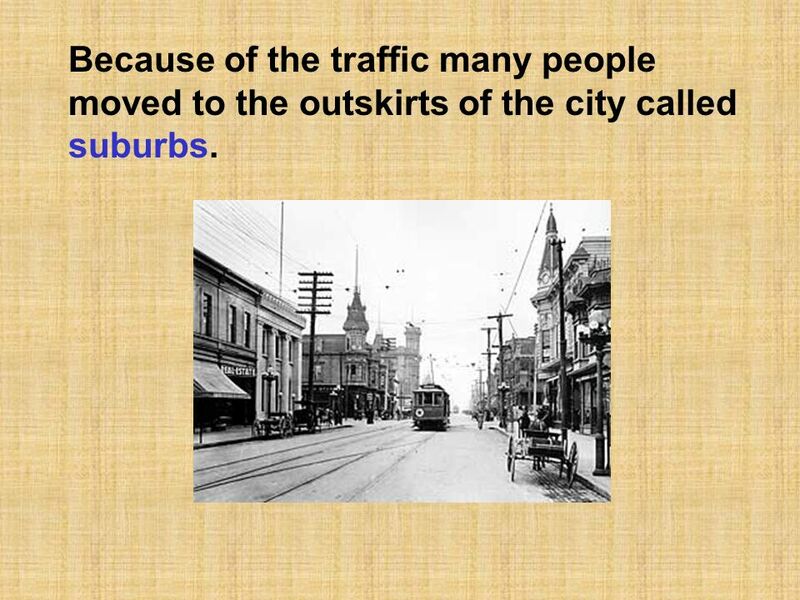 As more people moved into the cities, traffic jams developed. Downtown streets were choked with horse drawn buses, carriages and carts. 27 Because of the traffic many people moved to the outskirts of the city called suburbs. 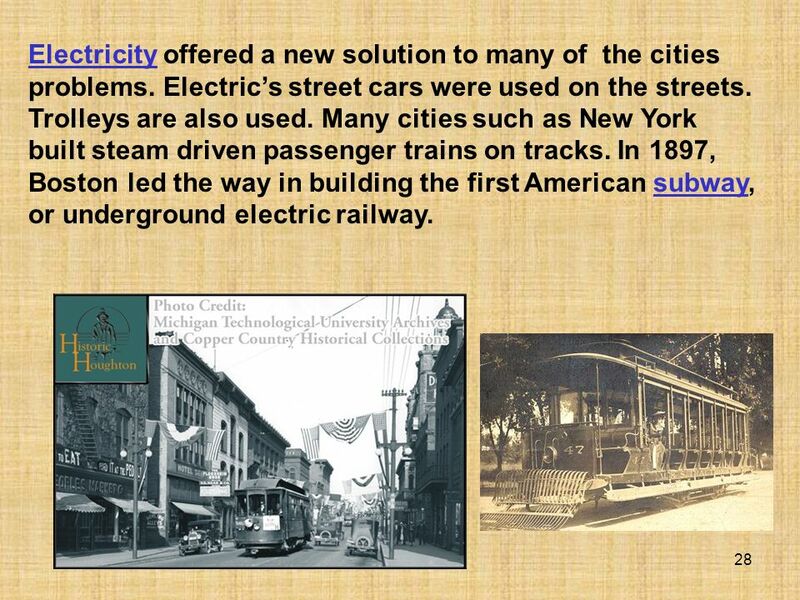 Electricity offered a new solution to many of the cities problems. Electric’s street cars were used on the streets. Trolleys are also used. Many cities such as New York built steam driven passenger trains on tracks. In 1897, Boston led the way in building the first American subway, or underground electric railway. Shopping areas that a new look. In the late 1800’s, department stores sprang up. A department store sold all kinds of items in different sections or departments. 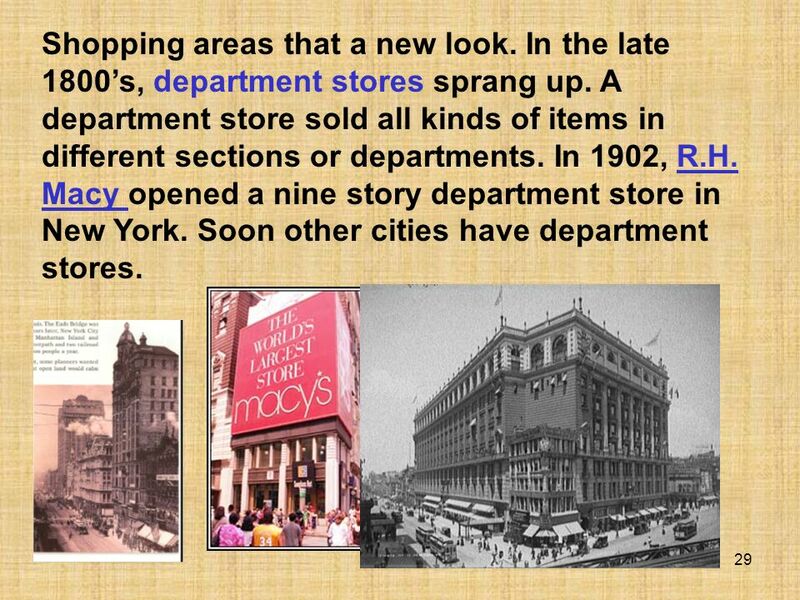 In 1902, R.H. Macy opened a nine story department store in New York. Soon other cities have department stores. 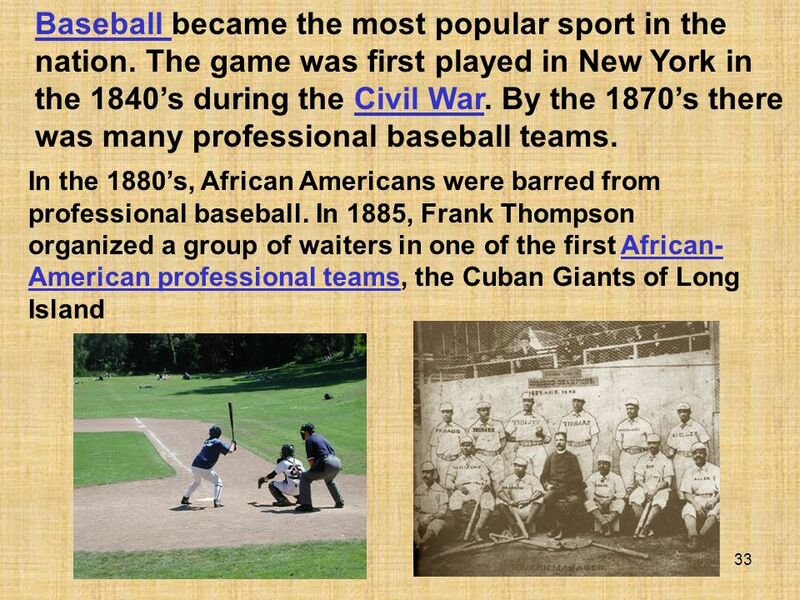 30 By the late 1800’s, American cities supported a wide variety of cultural activities. Many contributions were made to the world of music and theater by immigrants. Music and other kinds of entertainment brought Americans together. Many vaudeville houses opened in the cities. 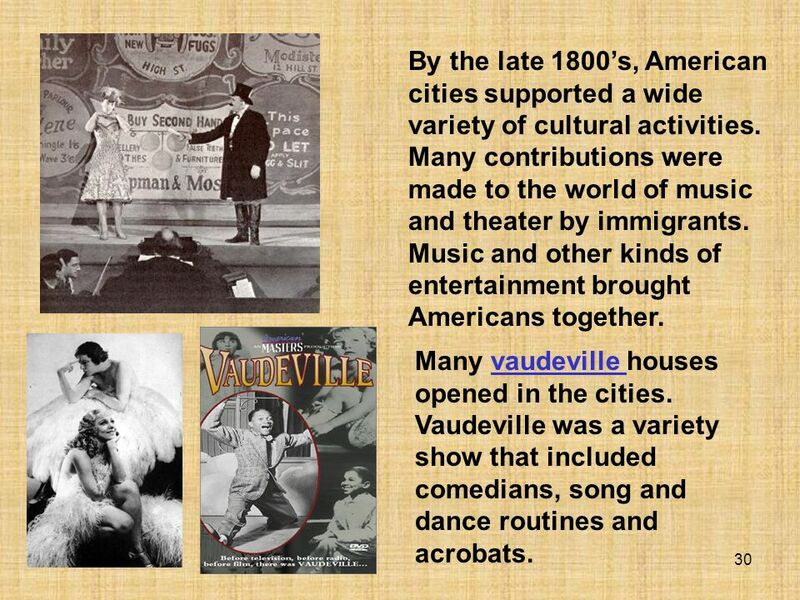 Vaudeville was a variety show that included comedians, song and dance routines and acrobats. 31 Songwriters produced many popular tunes such as Shine On, and Harvest Moon. Ragtime was a new kind of music with lively, rhythmic sounds. 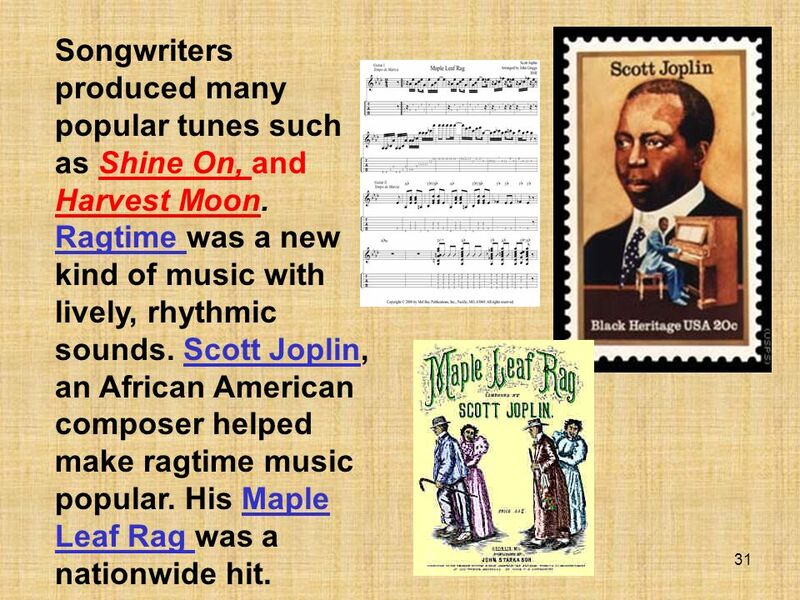 Scott Joplin, an African American composer helped make ragtime music popular. His Maple Leaf Rag was a nationwide hit. 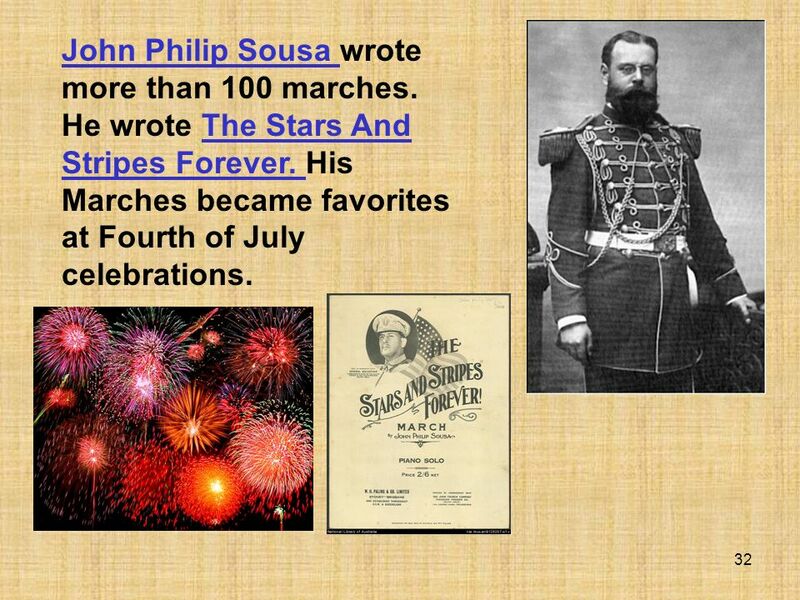 John Philip Sousa wrote more than 100 marches. He wrote The Stars And Stripes Forever. His Marches became favorites at Fourth of July celebrations. 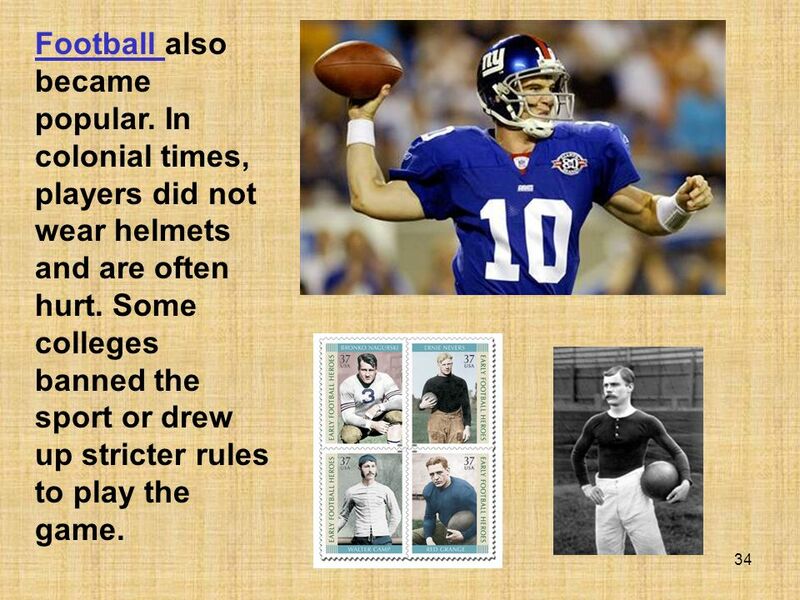 Football also became popular. In colonial times, players did not wear helmets and are often hurt. Some colleges banned the sport or drew up stricter rules to play the game. 1891, James Naismith invented a new sport called basketball. 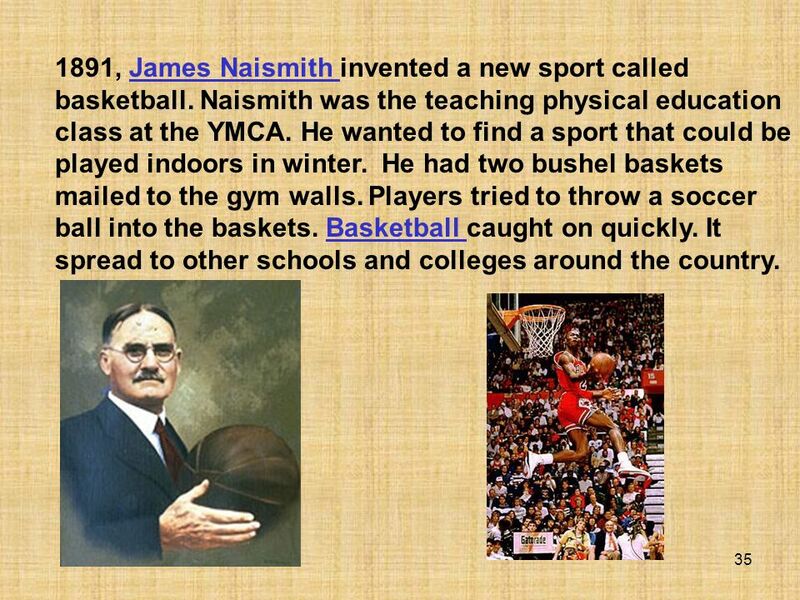 Naismith was the teaching physical education class at the YMCA. He wanted to find a sport that could be played indoors in winter. He had two bushel baskets mailed to the gym walls. Players tried to throw a soccer ball into the baskets. Basketball caught on quickly. It spread to other schools and colleges around the country. Before 1870, fewer than half of the American children went to school. Many who did attend went to one room schoolhouses with only one teacher. Oftentimes, several students shared a single book. As industry grew after the Civil War, the nation needed an educated work force. As a result, state’s improve public schools at all levels. By 1900, they were 4,000 programs serving children between the ages of three and seven across the nation. 37 In the North, most states have laws that require children to attend school, usually through the sixth grade. 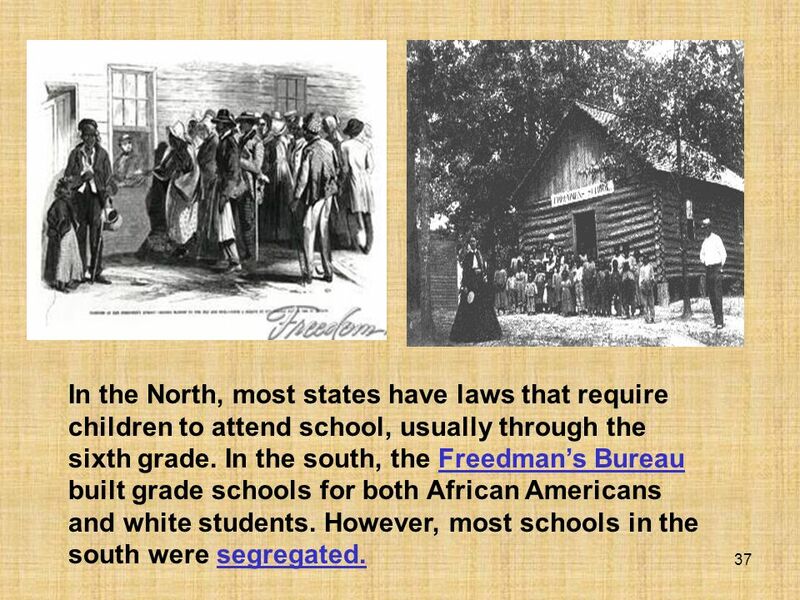 In the south, the Freedman’s Bureau built grade schools for both African Americans and white students. However, most schools in the south were segregated. 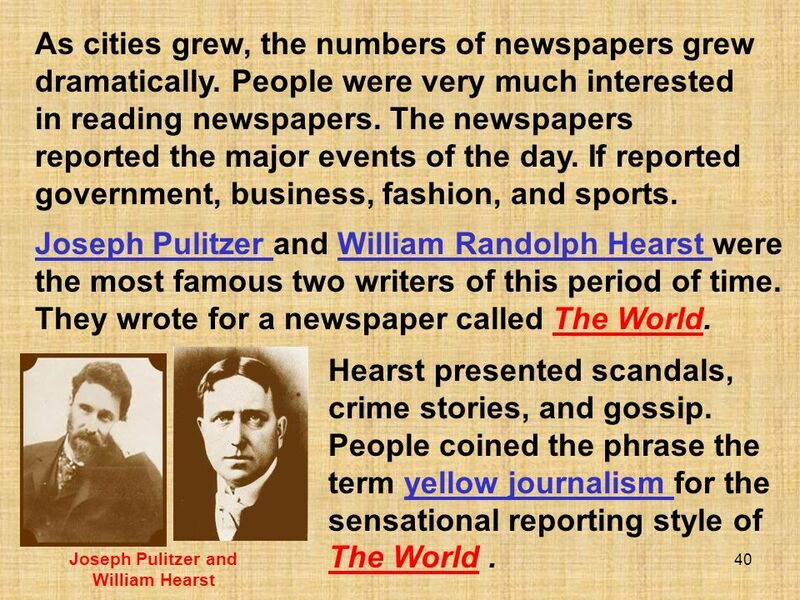 39 As many more Americans learn to read in the late 1880’s eighties, they read not only newspapers but books and magazines. Magazines such as the Ladies Home Journal appealed to the middle class women articles about famous people in stores are well known authors. Paperback books became popular in the 1800’s. Best-selling novels were often called Dime Novels. 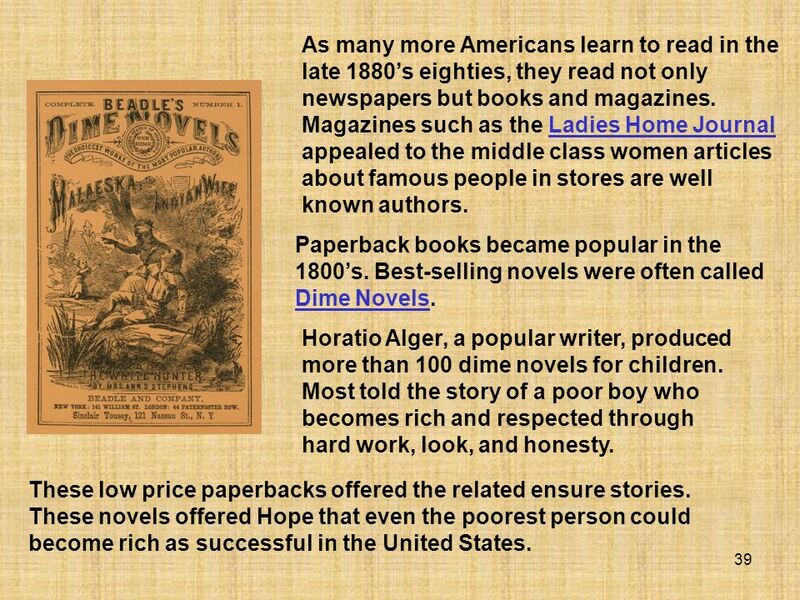 Horatio Alger, a popular writer, produced more than 100 dime novels for children. Most told the story of a poor boy who becomes rich and respected through hard work, look, and honesty. These low price paperbacks offered the related ensure stories. These novels offered Hope that even the poorest person could become rich as successful in the United States. Women also became journalists. 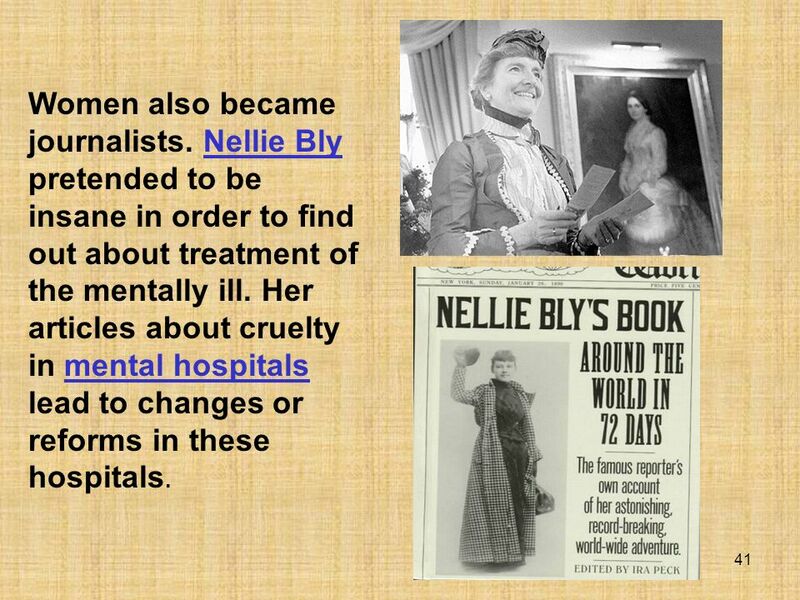 Nellie Bly pretended to be insane in order to find out about treatment of the mentally ill. Her articles about cruelty in mental hospitals lead to changes or reforms in these hospitals. 42 The most famous and popular author of this period was Samuel Clemens, better known by his pen name, Mark Twain. Like many other American writers, Mark Twain used to local color to make his store is more realistic. Local color refers to the speech and habits of a particular region. 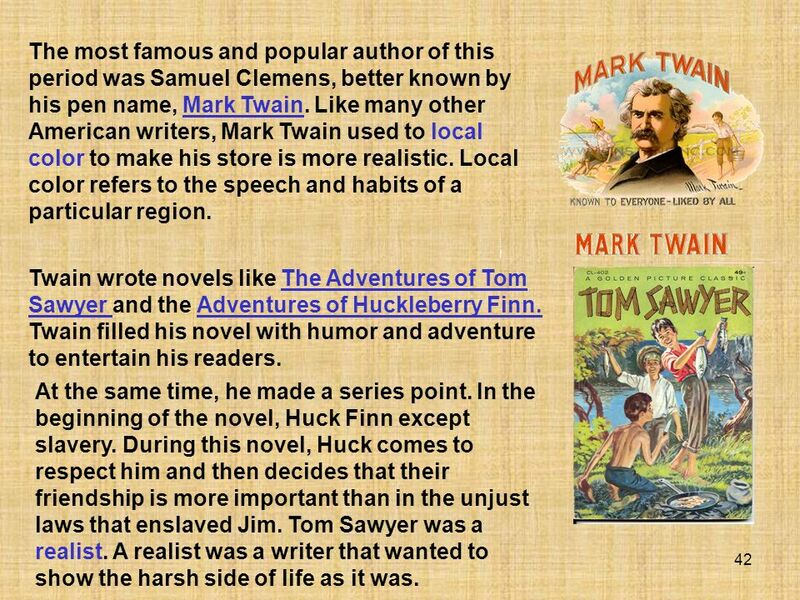 Twain wrote novels like The Adventures of Tom Sawyer and the Adventures of Huckleberry Finn. Twain filled his novel with humor and adventure to entertain his readers. At the same time, he made a series point. In the beginning of the novel, Huck Finn except slavery. During this novel, Huck comes to respect him and then decides that their friendship is more important than in the unjust laws that enslaved Jim. Tom Sawyer was a realist. A realist was a writer that wanted to show the harsh side of life as it was. 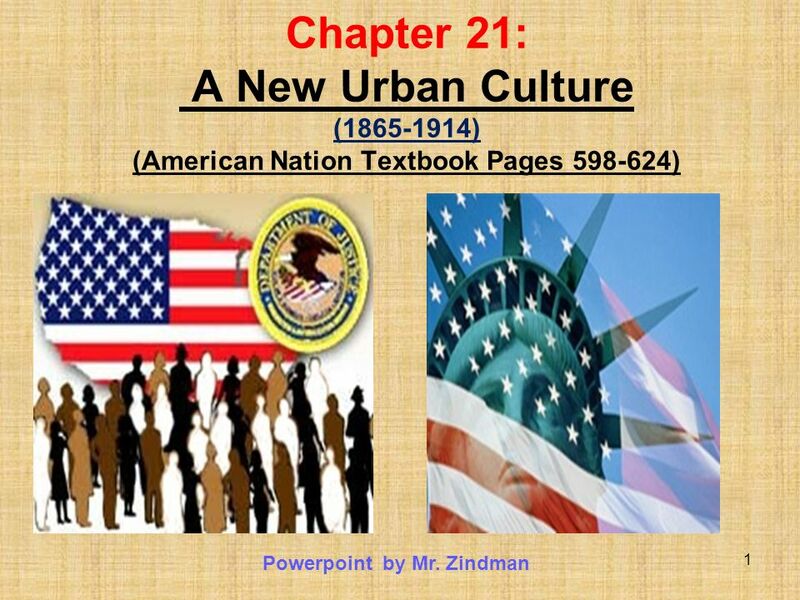 Download ppt "Powerpoint by Mr. Zindman"
Immigrants to America Chapter 8 Lessons 2, 3, & 4. 21-2: An Age of Cities. Ch. 15 IDs. 1.) Ellis Island What – Immigrant inspection station Where – New York City, NY When – Significance – Major center for immigration. What do we call people who come to a place from a different country? Immigration when people move from one country to another. U.S. History. America After the Civil War: The West The West: frontier Farmers, ranchers, & miners closed the last of the frontier at the expense. 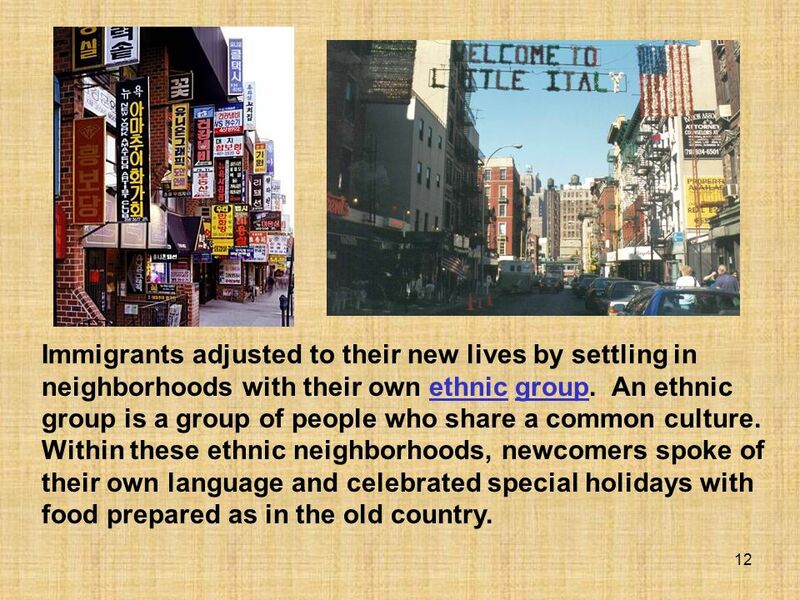 Toward an Urban America Old Immigrants came from northern and western Europe. They spoke English and were protestant and blended easily. 21-2. “We can not all live in cities, yet nearly all seem determined to do so” –Horace Greenly Urbanization: Movement of population from farms to cities. About Tenement Houses??? About conditions in the cities??? About the lives of immigrants??? 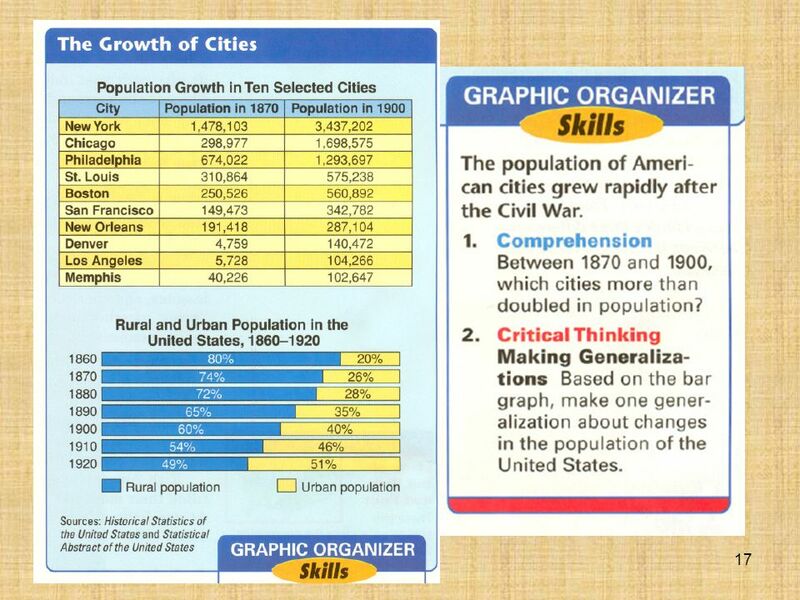 Objectives Explain why cities grew in the late 1800s. 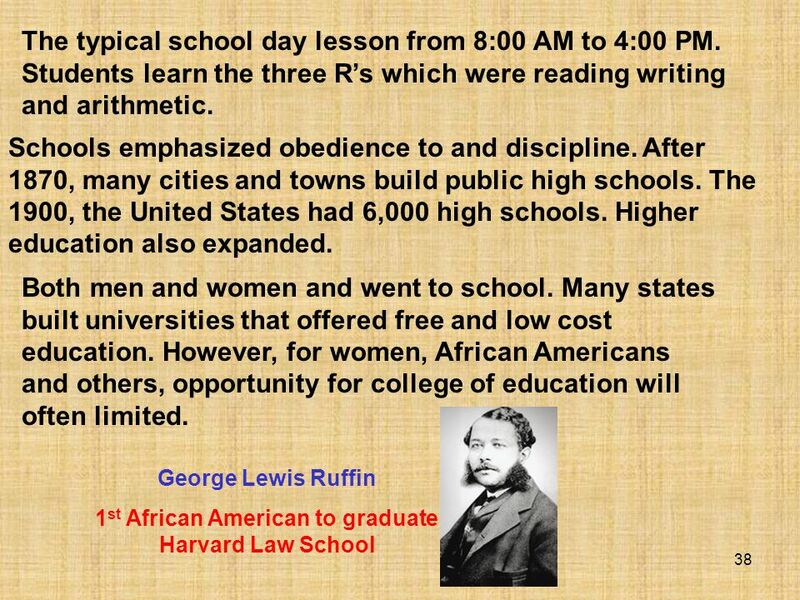 Objectives Explain how public education changed after 1870. 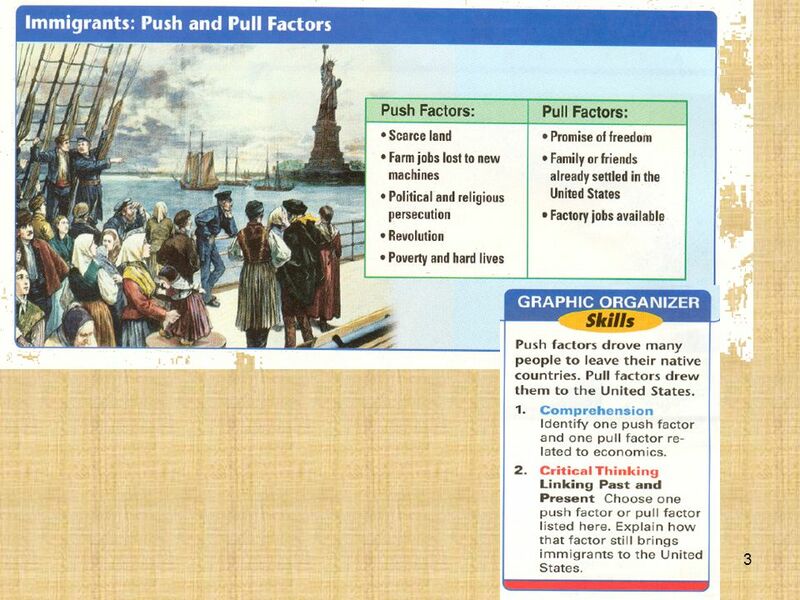 PAGES TIME PERIOD: Chapter 8, Lesson 2: Immigrants in America. Chapter 21, Section 4: Public Education & American Culture Main Idea: The growth of public education was closely linked to other changes in American culture.